Click on the download button and subscribe to the Quero AdBlock IE TPL list. This is an ad blocking Tracking Protection List (TPL) for Internet Explorer 11, 10 and 9, based on the Adblock Plus EasyList. This method is an addition to the "Hide Ads" feature of the Quero Toolbar and can also be used without any add-ons. Once you subscribe to the Quero AdBlock IE TPL it is automatically updated. By default IE has a list called "Your Personalized List", I recommend disabling that list, because it can silently add more rules by a heuristic and break some third-party functionality. Note that disabling Tracking Protection by the IE address bar, actually whitelists the current site. To reenable Tracking Protection on that site click on the Tracking Protection icon in the IE address bar. 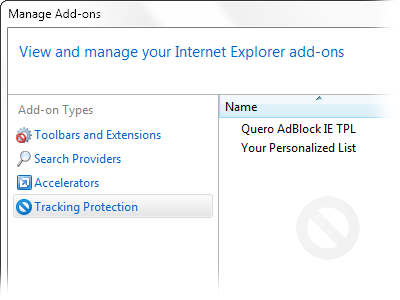 You can easily turn off or remove Quero AdBlock IE TPL under Tools > Safety > Tracking Protection, which opens the Manage add-ons dialog. In order to get an even more effective filtering solution for IE, install the Quero Toolbar and use Quero's Flash Hider.